What’s an eastern wood-pewee look like anyway? An eastern wood-pewee perches on a branch in Danbury, Conn., summer 2017. I stepped out onto the back deck this morning, coffee in one hand and a freshly cleaned and filled hummingbird feeder in the other. The din of a distant interstate highway and the song of an eastern wood-pewee were the only sounds I heard. The high-pitched “pe-weee” is ubiquitous in the summer in my woods. On mid-summer afternoon walks, sometimes that song is the only sign of birdlife to be experienced. 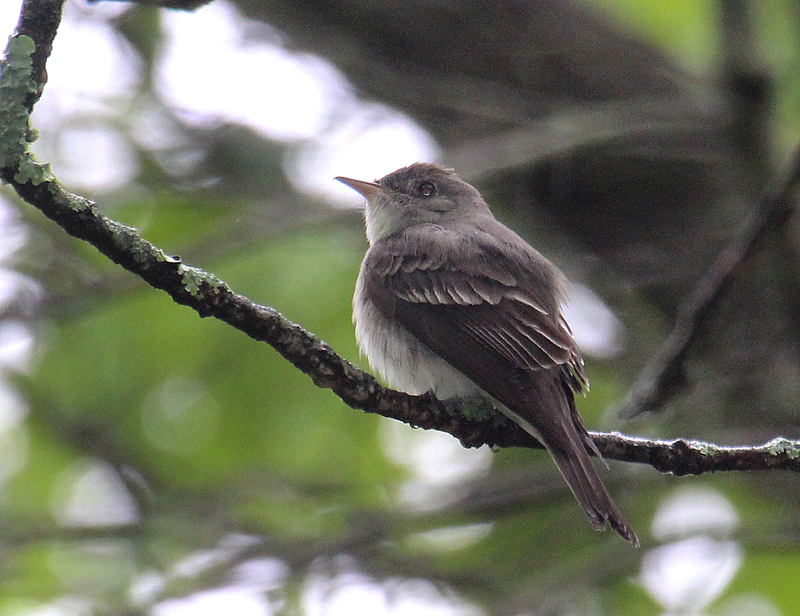 But while the eastern wood-pewee is often heard in New England woods, it isn’t seen as often. The woods are thick with vegetation and leaves in the summer, providing cover for the birds. Lighting is poor in the woods as those same leaves block the sun from illuminating the scene. Finally, eastern wood-pewees are small, nondescript birds. They don’t exactly stand out in a crowd. So for the casual birder, and even some more experienced ones, eastern wood-pewees are often heard and rarely seen. Earlier this year, I found a stunned pewee on my front porch. It had hit my storm door and fell to the ground. Luckily it was only stunned and I picked it up, held it in my hand for a few minutes and watched it fly off to a nearby perch. As it collected its wits on the branch for a few moments, I had the opportunity to grab a few photos of it before it flew off to parts unknown. I posted a few months ago a few photos of the bird while it was in my hand. Click here for that posting. 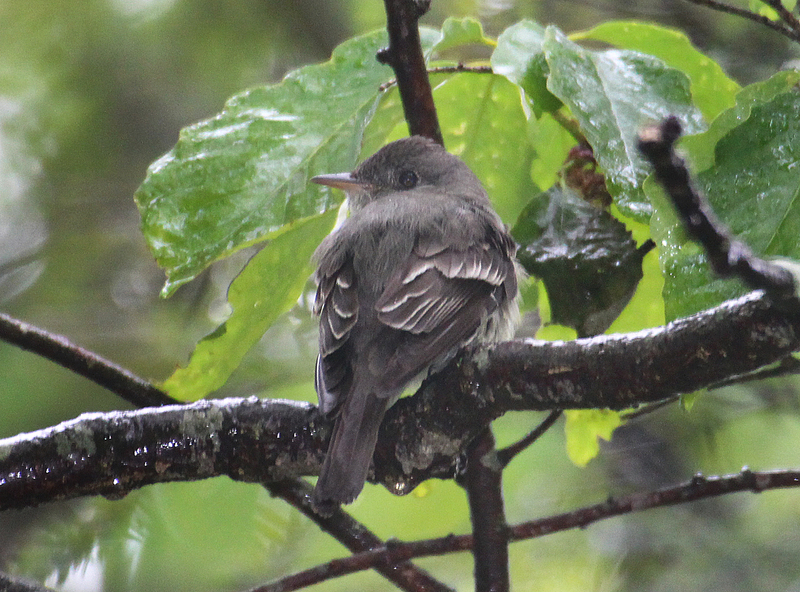 Here are a few photos of an eastern wood-pewee in a more natural setting. Now you can see why they are so tough to find in the shaded woods. This entry was posted in backyard birding and tagged eastern wood-pewee by Chris Bosak. Bookmark the permalink.